Inertial measuring systems shall ac­quire measurement data without in­ter­ruption. Otherwise there will occur a significant loss of inertial data and an accurate determination of an­gular in­formation is corrupted due to the need of con­tinuous signal integra­tion of rota­tion rates. Also er­rors in posi­tion and ve­locity are the conse­quence if the power supply fails even only a short time. 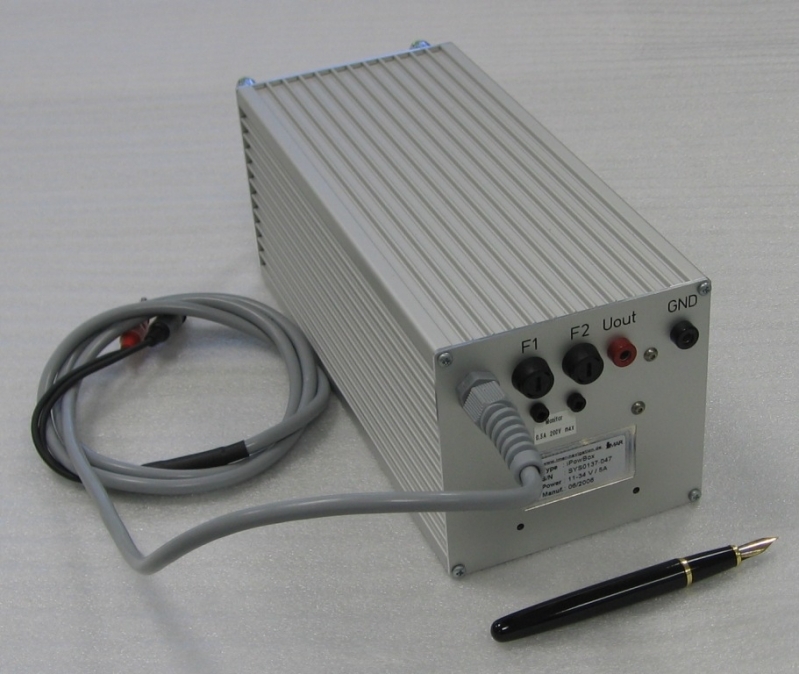 Therefore iMAR provides an interrupt resistant power supply for inertial measuring systems to allow autono­mous conti­nuous operation over a short duration, which is simply con­nected between the vehicle’s battery and the iner­tial measuring sys­tem. The system has two fuses (input / out­put), where a fault of a fuse is shown by an optical signal (red LED), if the button “Test” is pressed. Furthermore each system is equipped with a display to monitor the input volt­age, the battery voltage and the output voltage. To protect the iPowBox against deep dis­charge, it automatically swit­ches off after 20 seconds loss of input volt­age. At the backside of the housing the fuses are located. Furthermore two 4 mm plugs provide the output voltage of approx. 13 V.
Also two 2 mm monitor pins are avail­able at the backside of the housing: If the iPowBox is active, the two pins are also connected internally vai a relais contact (0.5 A, 200 V max). The internal battery is charged from the input voltage via a DC/DC converter. The output voltage is close to the input voltage as long as the input voltage is available. If the input voltage drops down, the output is hold to 12 V for about 15 up to 45 seconds (timeout adjustable as a factory setting). The iPowBox is recommended to be used with iDIS-FMS, iNAV-FMS, iNAV-RQH, iDRPOS.32 or iVRU on vehicles, where the battery voltage drops down during ignition of the vehicle's engine. The unit automatically powers down when the input voltage is absent for a defined duration (factory settings). Nevertheless it is recommended to switch-off the unit after usage.